I received several Sofn’Free GroHealthy Nothing But hair care products in my April and May 2012 CurlKit, which was lucky for me because I have wanted to try the products for a while. Although, I have known about the Sofn’Free Company since I can remember. I did not know about the new Nothing But product line. · Sofn’freen’pretty is the safe, gentle, and therapeutic hair care line specially formulated with olive and sunflower oils for the unique needs of your child’s hair, leaving it softer, shinier and more manageable. · Sofn’free GroHealthy Milk & Olive products use a unique, restorative 3-part blend of milk protein, Italian olive oil and omega 3 from the Peruvian Sachi Inchi nut and Moroccan Argan oil to make stressed damaged hair unbelievably beautiful and healthier. · Sofn’freen'pretty GroHealthy is the very first children's product line made to treat a child’s unique problems, using natural ingredients like omega 3, olive oil and shea butter, that are proven to speed healing, end chronic dryness, repair damage and promote growth. The GroHealthy Nothing But line, has a variety of seven different products including shampoos, conditioners and moisturizers, they are all free of petroleum, mineral oils, sulfates, parabens, colorants, and phthalates. By understanding the changes in our natural hair needs, Nothing But contains products such as wheat germ, tea tree oil, Vitamin E and keratin, to provide moisture, texture, thickness, and propensity regardless of ethnicity. In addition, the company has made the products affordable and easily accessible to the public. I have been keeping up with my TWA (teeny weenie afro), which I love. The whole idea of wash and go is something I have been enjoying since I did the big chop. With that, I used the Nothing But products to co-wash and/or as a styling aid to my wash and go. Overall Thoughts: I added the curl pudding along with B.A.S.K’s hair milk after co-washing my hair with Yes to Cucumbers conditioner. The consistency of the curl pudding is thick and creamy like lotion, has a light clean fragrance with a hint of cherry. The product did define my curls, but it felt like a film was on my hair. I did not care for the filmy feeling; this led to me wanting to wash the product out of my hair. I did not like the curly pudding and would not purchase it for future use. Overall Thoughts: First I used the curl sealer after I co-washed my hair with Yes to Cucumbers conditioner, and adding Cantu Shea Butter Leave-In conditioner, and Beautiful Textures Whipped Hair Butter, I saturated my hair with the curl sealer, and then finger combed my hair. I did like how the product defined my curls and made my hair feel soft after air drying. My curls stayed soft and defined all day. Then I used the curl sealer on dry hair concentrating on my ends, and covering my hair with a silk bonnet before going to bed. When I woke the next morning, I used a spray bottle to wet my hair, and then finger combed my hair. My hair curls reappeared all was good. This product is a favorite and I will be purchasing the curl sealer again. 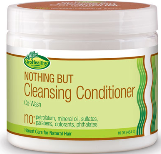 Product Description: GroHealthy’s Cleansing Conditioner (Co-Wash) you don’t have to. Using nothing but simple ingredients, it leaves your hair perfectly conditioned and beautifully cleans. Overall Thoughts: I used the cleansing conditioner as directed. I wet my hair, applied the cleansing conditioner, and used my fingers to distribute the product through my hair. I only had a small sample packet so I was not able to repeat the steps as I usually do with other conditioners. Even so the cleansing conditioner did perform as stated by the company. I will purchase this product for everyday use. Overall Thoughts: I used the wake up spray after waking up from a nap. Since I had to run to the store, I sprayed several pumps in my hair, and finger combed. The product soaked in my hair quickly and I was ready to face the public. The one thing that I didn’t like is the way the product sprayed out. It did not spay out in a mist, but in a straight stream. This could just be my bottle that did this, but that led to the product concentrating in one area. So I had to use my hands to distribute throughout my hair. I would try the product again, hoping for a bottle that distributes the product in a mist. Have you tried any of the Nothing But products? If so, let me know what you think.